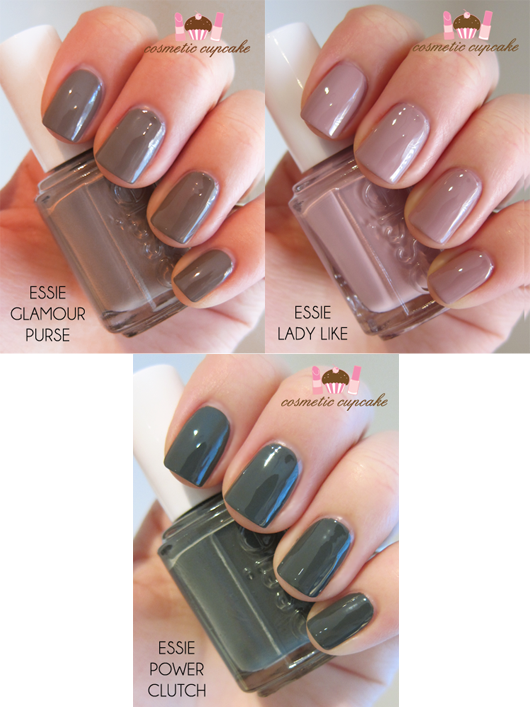 Today I have some quick swatches for you from the Essie Fall 2012 collection which was released last month here in Australia. I was very kindly sent Glamour Purse, Lady Like and Power Clutch to try out and show you! "Elegant, sophisticated and mixed with the right amount of fun, this season Essie’s inspiration stems from designer handbags and powerful business women - think Mad Men! 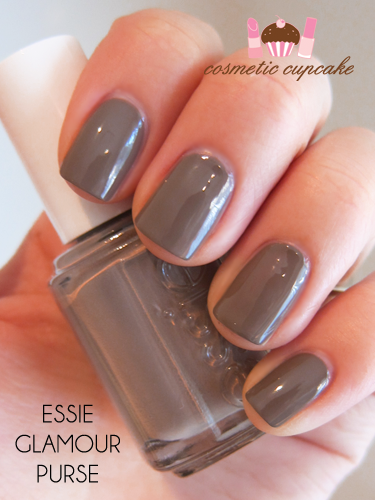 The mix of velvety hues and lady like nudes makes Essie’s Fall 2012 Collection an easy choice for those women who mix business and pleasure. 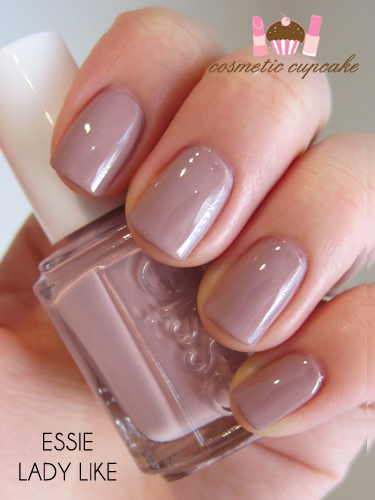 Easy to apply and chip safe, Essie Fall 2012 collection has fingers and toes covered for work, play and everything in between." Glamour Purse is described as an "almond taupe" which I'd say is a pretty good description however it translates slightly darker on the nail. There are quite a few colours out there which are similar but I'm still digging these shades for the cooler months! 2 coats is pictured. 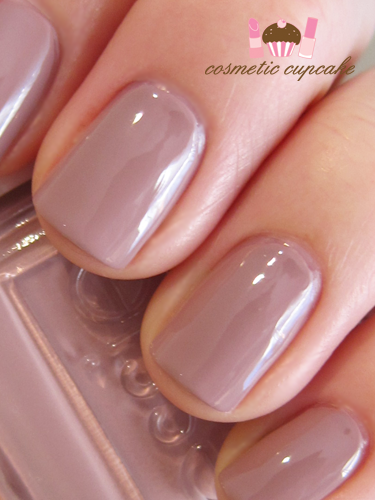 Lady Like is a gorgeous muted mauve. It's very fall and is SO so pretty! 2 coats is pictured. Power Clutch is a darkened grey green. It's an unusual colour and my camera didn't want to capture it properly! 2 coats is pictured. Overall: These colours are PERFECT for the cooler months - they just scream fall! The formula on these was consistent and perfectly opaque in 2 coats. They applied excellently and dried to the usual Essie high gloss formula (yes you can see my big head reflected haha). The colours in the collection are really work appropriate but still interesting. My favourite would have to be Lady Like - it's such a beautiful colour! 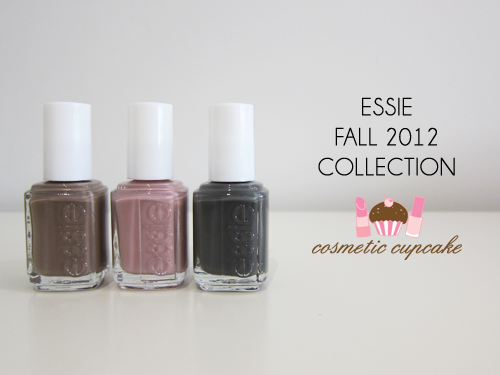 Details: The Essie Fall 2012 collection is available now nationally from Myer, Hairhouse Warehouse stores and selected salons for $18.95. These are absolutely gorgeous, thanks for the swatches! I particularly like Power Clutch. Glad to hear you like them Panni! OMG! I love it chelle *-* Are so cute and elegant at the same time! Glad you like the polishes Marie! I think these colours are really elegant too. Great for fall! They're beautiful; I love these kinds of colours! However, the first two look too similar to ones I have already. Power Clutch is more exciting, though! Same here Rinnie! Yeah the 1st 2 can be duped as they're more the usual Fall colours. The colors are really rather cold. I somewhat only like the power clutch! I guess Essie were really going with the cooler colours for Fall. Hehe thanks Moni! Really like your swatch pictures. Glad you like the colours Isabelle! I think these are great colours for Fall. Awww so glad you enjoy my swatches. Thanks for letting me know! Wow the are soo nice! I like lady like the most! Lady Like is my favourite too! you know that those are from the fall 2011 collection..? Unfortunately Australia is always several collections behind due to seasons so this is in fact the Fall 2012 collection for us. 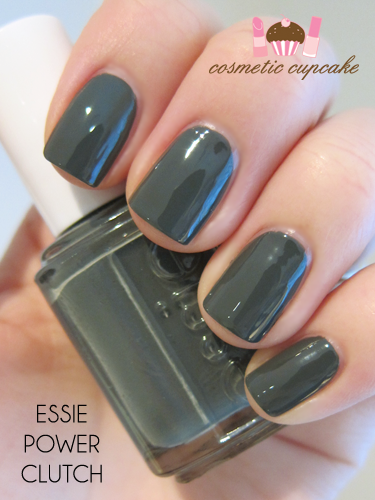 I am sent the Australian press releases from the Australian PR for Essie.